These 65 beautifully crafted illustrations will inspire the readers to connect to nature and unwind. Uplifting nature quotes refresh and inspire, while brief nature facts on the spread's flora and fauna provide extra insight into some of the state's gems. Added white space on the left side of each spread allows for writing, journaling, or freehand drawing. Each spread's unique and artful illustration combined with the reader/artist's coloring create a piece that can be proudly displayed on a wall or refrigerator. Whether you are a Colorado resident, or visitor this journal keeps you connected to the state you love. Amanda Lenz is a professional illustrator working and living in Boulder, Colorado. 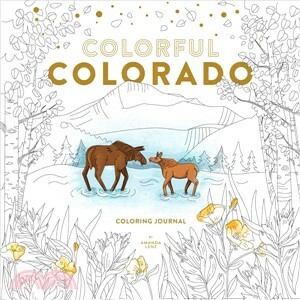 Her background in fine art and design paired with the love of the outdoors come together in the Colorful Colorado Coloring Journal to create rich, nature-inspired illustrations meant to be unique artworks.